The Brice Marden retrospective at the SF Moma is a traveling show of Mardenâ? ?s work from the 1960s to today. I takes up the entire 4th floor at the SF Moma and consists of several bodies of work, sales including drawings which Marden considered as important as his paintings, store if not more so. I notices a few things overall about his lifetime of work. I couldnâ? ?t help but notice his treatment of the sides of his canvases. In his earlier colorfield paintings, order he leaves them unpainted, except for unintentional streaks that naturally make their way to the sides. With such simple paintings, the viewer canâ? ?t help but take notice of the sides and how they effect the overall painting. By not painting the sides, I think Marden wants us to be aware that these are paintings, not objects, painted one stroke at a time by human hands. His handwork is revealed throughout and is reenfoced by the unfinished sides. Later on, he starts to pay more attention to the sides of the canvas. During his Greek colorfield series in the 1970s, Marden starts to paint the sides halfway. Was he bothered by how distracting the rough sides were? Was he less concerned with showing the viewer his hand? By the 1990s he has completely started painting all thw way around the canvas. 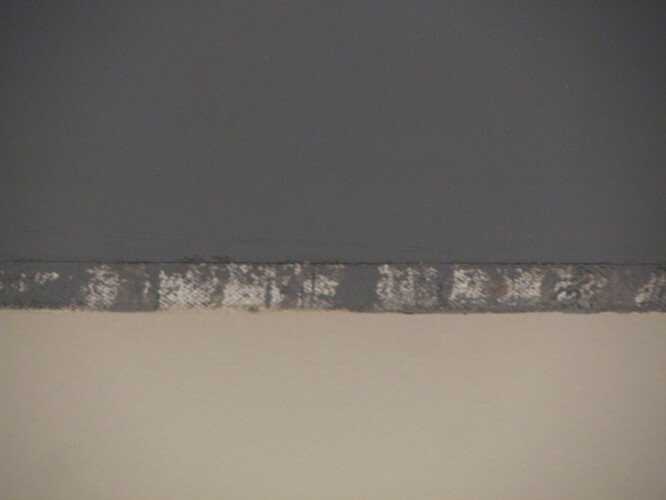 The edges are painted the same color as the ground but the linear marks do not extend past the edge of the canvas. Marden also seems to develop a stronger relationship to the edges of the canvas as the years pass. In his colorfield paintings the bottom edge is accentuated in almost every painting, sometimes other edges are accentuated with thin color lines or roughly painted areas. The early calligraphic work seems to loose this relationship to the edge but in his later works, especially starting in the early 90s onward, his relationship with the edge of the canvas develops until he outlines the entire edge in his latest paintings like The Propetious Garden of Plane Image, first and third version. The use of beeswax in Brice Mardenâ? ?s earlier colorfield works server several purposes. They make the pigments in the paint more luminous by suspending the color in transparent wax. It gives the paintings a sort of glowing effect that you canâ? ?t get easily with straight oil paint on canvas. The beeswax also shows marks well. You can see the artistâ? ?s hand in the piece so although the paintings are of a fairly solid, flat color, the man made element is ever present. The beeswax has enough weight and texture to it that it makes the edges of Mardenâ? ?s paintings not smooth. This adds to the quality of line between paintings in this multi-panel pieces as well as adding a wonderfully soft edge to the outsides of the paintings. The painting I think relates to Crimpâ? ?s essay is the Seasons. Oil and beeswax on canvas. This 4 panel painting is about the colors and lights that Marden experienced in Greece. The paintings make the viewer think about environment, color, light of a place. There are signs of Marden trying to perfect the colors he was trying to emulate. The green painting on the far left has a visibly different color showing through. Marden leaves a thin strip on the bottom of each painting to reveal his making process. Without this strip, the painting would not have as much of a human quality. If that quality didnâ? ?t exist, the paintings would not be about human consciousness. I think Marden is trying to get us to really think about absorbing the information around us, to pay attention to color and light and sensation of the places we visit and live. The first few Calligraphic pieces that Marden was working on in the 80s donâ? ?t seem to have this same â? ?reflection on structure of consciousnessâ? feeling. They feel very rigid and it seems he was struggling to find a solution which I donâ? ?t think he was successful at until the cold mountain series. He seemed to have abandoned aspects of his earlier paintings that I think he eventually found to be essential to his art making. Especially the focus and accentuation of the edges of the canvas. He seemed to be using a very different color palette. I had a similar feeling about the greek collage pieces such as Souvenir de GrÃ©ce. Done in graphite, beeswax and collage on paper, they seem cold, geometric, architectural and too organized. Like the earlier calligraphic pieces, I felt that they were too forced. I think Marden was in a process for developing a system of artmaking that he hadnâ? ?t quite achieved yet. By the early 90s it seems clear to me that he had developed a successful system of some kind. And just like the earier colorfield paintings, his work really shows a human, poetic element.